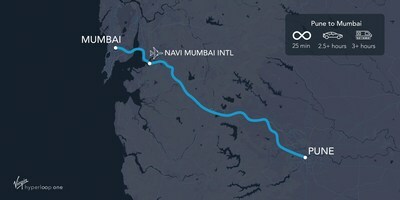 Virgin Hyperloop One today announced the Indian State of Maharashtra's intent to build a hyperloop between Pune and Mumbai beginning with an operational demonstration track. Virgin Group Founder and Virgin Hyperloop One Chairman Sir Richard Branson announced the Framework Agreement in the presence of the Hon'ble Prime Minister Narendra Modi and the Hon'ble Chief Minister of Maharashtra Devendra Fadnavis to begin the development of the route. This historic signing at the Magnetic Maharashtra event was also attended by Virgin Hyperloop One board members and key investors Sultan Ahmed bin Sulayem, CEO and Group Chairman of DP World, and Ziyavudin Magomedov, Chairman of Summa Group. Recognizing the Maharashtra government's contribution to the country's economy, Indian Prime Minister Narendra Modi said, "51 per cent of total investments in India have come to Maharashtra, and the state is attracting global investors. The state's overall development in the past few years is a shining example of change thinking and improving conditions in the country. Maharashtra government was ahead of all other Indian states in terms of infrastructure spend and the state is on its way to achieving its bold vision of a trillion dollar economy." The Pune-Mumbai route could result in USD $55 billion (INR ₹350,000 crores) in socio-economic benefits (time savings, emissions and accident reduction, operational cost savings, etc.) over 30 years of operation, according to an initial pre-feasibility study completed by Virgin Hyperloop One. The 100% electric, efficient hyperloop system will ease severe expressway congestion and could reduce greenhouse gas emissions by up to 150,000 tons annually. The project will enter a procurement stage upon the successful completion of the feasibility study to determine the public-private partnership structure. Construction of the Pune-Mumbai hyperloop route would commence after procurement and will be completed in two phases, beginning with an operational demonstration track built between two points on the route. The demonstration track will be constructed in two to three years from the signing of the agreement and serve as a platform for testing, certifying, and regulating the system for commercial operations. The second phase will target to complete construction of the full Pune-Mumbai route in five to seven years. Future projects could also extend the route to link central Pune with the New Pune International Airport and Jawaharlal Nehru Port in Mumbai with Pune's industrial economic zones. Virgin Hyperloop One is the only company in the world that has built a fully operational hyperloop system. Our team has the world's leading experts in engineering, technology, and transport project delivery, working in tandem with global partners and investors to make hyperloop a reality, now. Virgin Hyperloop One is backed by key investors including DP World, Caspian VC Partners (part of Summa Group), Virgin Group, Sherpa Capital, Abu Dhabi Capital Group, SNCF, GE Ventures, Formation 8, 137 Ventures, WTI, among others. For more information, visit www.virginhyperloopone.com.